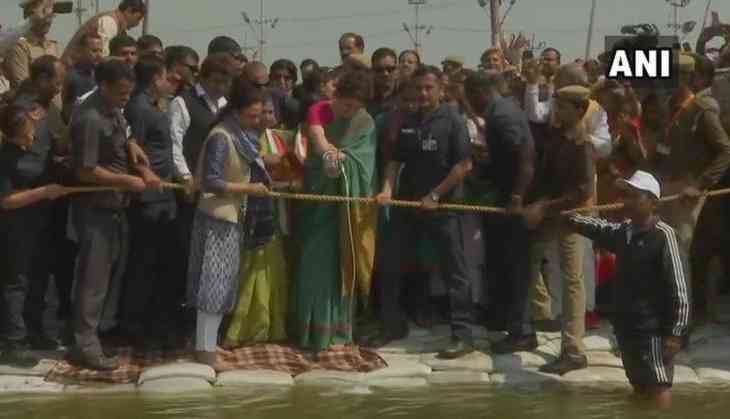 Ahead of the Lok Sabha election, Priyanka Gandhi Vadra has started off her poll campaign from the banks of river Ganga in Prayagraj and will embark upon a 140 km ‘Ganga-yatra’ to Varanasi. As per the schedule, Priyanka will be holding ‘Boat pe charcha’ with the students and will also interact with the communities who live across the river, mostly Mallahas. Today, ahead of starting the Ganga-yatra, Priyanka offered prayers at the Bade Hanuman Temple in Prayagraj. The sayings by many political pundits that Congress is playing the soft Hindutva card might be active. Priyanka Gandhi reached Lucknow on Sunday evening and met the delegations along with the party office bearer. The Election Commission announced that voting would begin from April 11 and results would be declared on May 23.